Technological progress means that, for more and more of us, a day at work involves sitting at a computer workstation. This increase in prolonged sitting and static work subjects the body to additional strain and as a consequence health and safety issues become a real concern. Ergonomics is the science of fitting the workplace to the worker to improve productivity and efficiency and to reduce ill health and accidents. Office work involving intensive computer use and prolonged periods of sitting is known to put people at risk of injury to the spine and arms. Ergonomic assessments identify this risk and provide practical recommendations to reduce it. For people with existing conditions, wider health issues or disabilities, assessments are an ideal way to gain specialist advice, which can help to improve efficiency of working, prevent employees from going off sick, and assist in their return after sickness absence. Sit with your bottom right to the back of the seat. Sit upright, leaning against the backrest so that it provides you with support. The head should be in line with the shoulders and over the buttocks. Adjust seat height so the hip joint is slightly higher than the knee joint or so that the hips and knees are at approximately 90°. The forearms should be parallel to the floor with the elbows at approximately 90°. 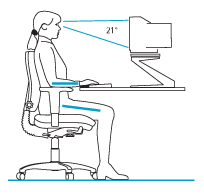 If the desk is too low raise with desk feet, if too high use a foot stand and raise the seat height. Place the mouse in easy reach by the keyboard. Should be at arms length and your eye level should fall within the upper third of the screen. Position the screen at 90° to any light source avoiding glare or reflections. Use a copyholder so input data is within the field of view. If used for more than 40% of the working day, consider a headset to free the hands for more efficient working. Create sufficient room to work especially if multitasking. Place equipment on stands or arms if necessary. Prevent static loading; rock or change position to reduce fatigue; place one foot in front of the other, alternate your position during the day. Take breaks and vary tasks. Perform regular neck and shoulder exercises and upper limb and lumber spine stretches.